If you were to describe our house, "peaceful" wouldn't crack the top 100. We're loud, we're busy and we stack things. That's my main organizational or "cleaning" challenge in my house: we stack things here, there and everywhere. So you don't walk around tripping over things all the time, and it's not that you look around and see junk on every surface. But look around the perimeters of the rooms, and you'll see stacks of toys, books and even clothes that have been folded but not put away. I hate that about myself. 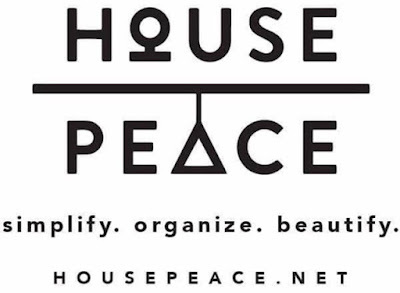 My friend Tara has a whole business -- House Peace -- built around helping people get organized. She offered to help me a couple of months ago, but I told her -- in all honesty -- that I had $10 in my hobby account and I couldn't afford to hire her at the time. Tara very sweetly offered to come over and just basically show me what she could do in a couple of hours, free of charge. Which she did. And although I didn't have any cash money to pay her, I DO still (kind of) have this blog, so I told her I'd at least write a blog post about it so I could share her talents with you. 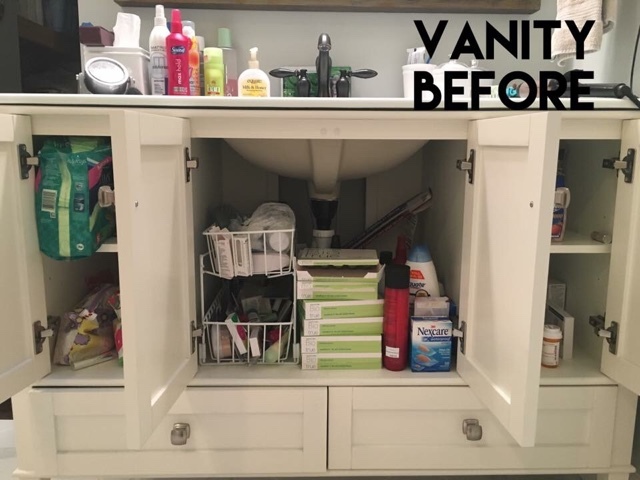 She didn't sponsor the post, but I did want you to know that I didn't pay for the organizational wizardry she worked in my master bath vanity. Not the worst you've maybe ever seen, but plenty of room for improvement. I'm not sure if -- SINCE YOU'RE NOT INTIMATELY FAMILIAR WITH MY TOILETRIES -- you can tell what she did here. 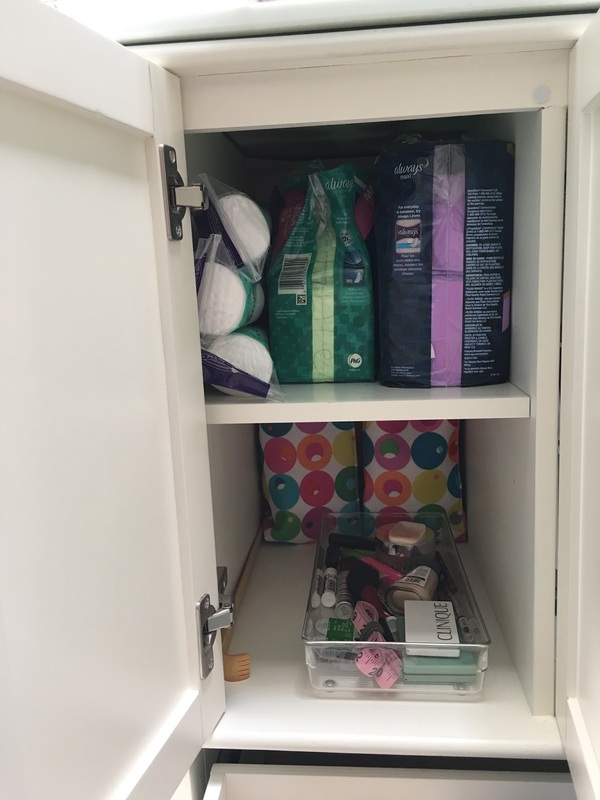 But she added another level of storage for my contacts and contact-related items in the center section, moved most of my haircare stuff to the top-left bin, and used Steri-Lite containers (which she provided) to corral things by category in the right cabinet. And she labeled everything. Was I proud and did I note out loud to her that I own the same exact labelmaker? YES I WAS AND YES I DID. Honestly. Who else on the Internet is showing you their panti-liners and cotton rounds in full living color? THIS IS WHY YOU COME TO GRASS STAINS. 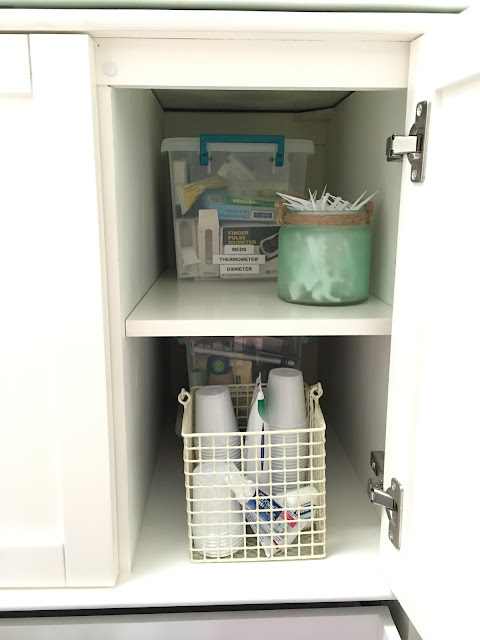 In the right cabinet, she used some containers that I already had, and I was completely fine with that. This is storage behind closed doors, and the things I reach for most often (flossers, plastic cups) are easily accessible. Unopened makeup and toothbrushes, our thermometer and other things I only need to access occasionally are stored in the labeled Steri-Lites. 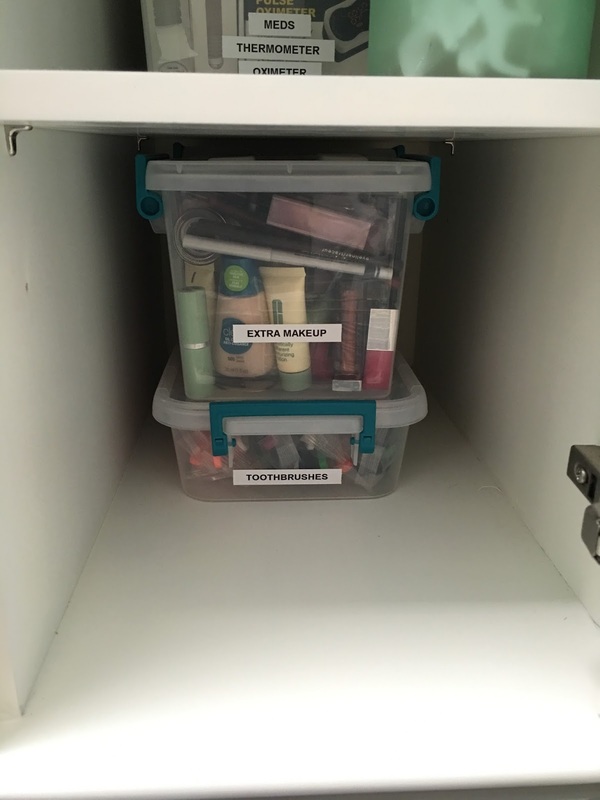 Finally, my daily makeup items remained in my easy-to-grab lucite tray, but she neatly stacked my Clinique-bonus bags that hold my fingernail polishes behind it. 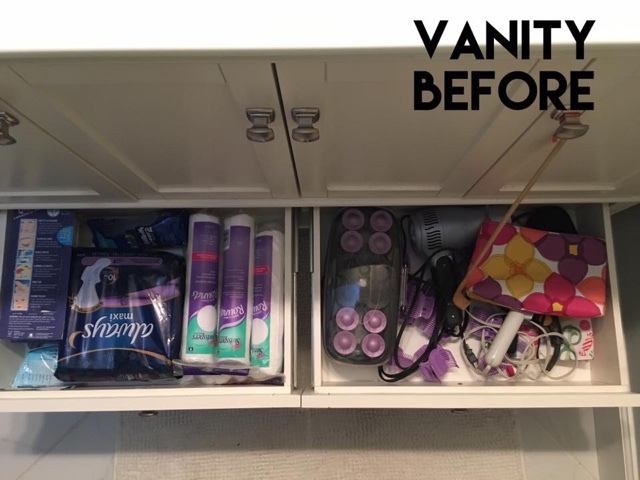 What she did in the vanity drawers is pretty self-explanatory ... mostly cleaning up all my hair tools on the right (which I don't use but which I refuse to throw away), and using 4x8-inch containers to organize things that often just float around. I asked Tara if she does "virtual consultations" for non-locals, and they do! Since most of you aren't here, I invite you to reach out to her if you have a need and are interested in seeing what she can do for you. To learn more about any of their plans and pricing, click here and then click "Our Process" at the top. Thanks for indulging me in sharing Tara and her business with you today!